It’s been about 25 years since manga or anime (animay) as it’s become known first came to mainstream attention around the world. The release of Akira, set in a post-WW3 Tokyo featuring biker gangs and teenagers with devastating psychic abilities, introduced a culture of animation far more mature, nuanced and imaginative than had previously been seen before coming from Japan. The impact was instantaneous and the genre was immediately accepted becoming as familiar to the young as American cartoons had in the earlier part of the century. There are 430 anime studios in Japan producing a wide range of animation. The Japanese system of producing these types of films has a structure that creates directors who are responsible for every aspect of the film unlike the American system which has a number of department heads. The directors are consequently held in the regard we would attribute to live-action film directors and Hayao Miyazaki is the one director whose work has been regularly received by critics worldwide with rigour and respect. He had a slight mis-fire when Nausicaä of the Valley of the Wind, made in the mid 80s pre-empting the boom in anime, was re-edited to the point of senselessness by American distributors but since then and after co-founding Studio Ghibli (Jibli) to produce his and other animations, the praise and accolades towards Miyazaki has been relentless. Miyazaki often explores similar themes, environmentalism, technology, feminism, independent young girls or teenagers have often been the main focus of his films, the supernatural and controversially in the case of this film, pacifism. It’s apt that his earliest memories inform what is to be his final feature film, as a child Miyazaki dreamed of flight, imagining his body skimming the clouds above the cities where he grew up before suddenly twisting and hurtling downwards, waking with a jump before he hit the earth. His father ran a company which manufactured tail fins for Japanese fighter planes during WW2 and though intrigued by the mechanics of the planes he denies the link between what he saw on a daily basis and what informed his dreams and it’s this conflict between the dreamworld and reality that forms the basis for this film. Through the fictionalised biography of a real aircraft designer, Jiro Horikoshi, he explores the themes previously mentioned to a greater degree than before speaking extensively after the film’s release about the flights of fancy contained and the harsh truths. That exploration has consequently opened Miyazaki up to a level of criticism from his homeland he’s not received before. Post-release, his recent direct statement towards Prime Minister Abe’s proposed moves to revise Article 9 of the Constitution of Japan, which outlaws war as a means to settle international disputes had Nationalists calling him a traitor whilst Liberals had been left angry that a film featuring a man whose work was eventually used for ill could be a seen as a hero. 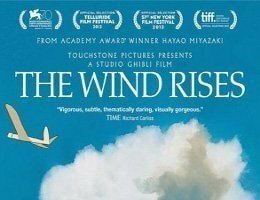 From some reading up it appears that for his last film Miyazaki’s examining his own life, his experiences in wartime and peacetime Japan, life as an artist and as a man and the control and loss of ideas, their interpretations, their implementation, their corruption and their consequences. Of those that gave feedback, the most common score was 4/5 with some audience members scoring 5/5. The film wasn’t to everyone’s taste though as three people gave the film 2/5, one person saying the film was ‘boring’. This was by no means typical, several people said the film was ‘magical’ and some commented on how they had been informed on Japanese history, culture and perspective. A couple of people found the American accents on the soundtrack distracting. Many commented on the quality of the animation and indeed the sound, with human voice being used for some sound effects. Some found the film to be too long. Overall though, Andover enjoyed this slice of Japanese anime. ‘Possibly Dumont’s finest’ – F. C.
This is 3 days in the life of French sculptor, Camille Claudel. After a breakdown she had been committed by her family to an asylum near Paris in 1913. With the outbreak of the First World War she was transferred to another asylum at Montfavet in south-eastern France. She is awaiting a visit from her brother Paul whom she hopes will have her released. Paul does come but the visit does not go well. He is cold and rejecting and refuses to have her released. She was never allowed to leave and spent the remaining 29 years of her life in the asylum at Montfavet. Leading French actress, Juliette Binoche, plays Camille Claudel. This is very much her film. In keeping with the subject matter, the tone of this film is stripped-down and harsh. With her as fellow inmates were cast real psychiatric patients. Their consent to take part had been sought, either directly if their condition allowed, or through their family if it was clear their condition would not permit them to make a free choice. Monday’s ‘Extraordinary, haunting’ and ‘moving’ film brought many positive comments ‘despite the subject matter’ and that ‘the story was truly sad’. This ‘hard hitting’ film walked a very fine line as the ‘close camera work forced you to confront the mentally ill’ prompting one member to observe it as a ‘Disturbing, unsavoury film, well executed’. The difficult elements were further mused upon by one comment ‘Question(ing) the ethics of using such handicapped people’ as part of the cast. The film asked many questions, bringing back ‘many painful memories’ for one correspondent as another asked ‘Was she (Camille) mad or was he? (Paul) Or both? Whilst an ‘Interesting concept’ was introduced regarding how an ‘Artist’s imagination (was) perceived as madness’, the ‘injustice’ forcing her to live as a ‘caged bird’. This ‘Very French’ film garnered much praise for Juliette Binoche as reviews such as ‘Brilliant performance’ ‘Superb’ and ‘Amazing’ were received, in some instances the rest of the ‘average’ film wasn’t as highly regarded, ‘Well acted, her life was bad, the film was worse’. Most though acknowledged it as ‘Not an easy watch, but well worth it’. 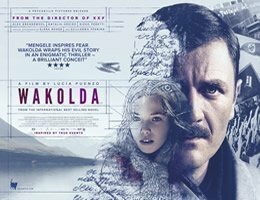 Wakolda is written and directed by Lucia Puenzo and is based on her fifth novel, Puenzo who has also made two other films previously, based it initially on a series of short stories she was writing about a teenage girl falling in love with an older German man sometime after WWII. Though various articles have said it’s based on a true story further reading seems to suggest that’s pushing credibility a bit far. Without saying too much what is true are the more general facts, such as the impunity with which fugitive Nazi’s were allowed to live not only in Argentina but all of Latin America. Not only were there culturally sympathetic German immigrant/expat communities across the Continent there were also says Puenzo and perhaps even more disturbingly; “A lot of military regimes in power at that time, and leaders who had open minds about learning from other military regimes”, “I can remember” she continues, “My grandparents saying, there was a German man in the neighbourhood, and nobody said anything. It’s difficult to understand, but it was the same for other things in our history. There were military regimes. People closed their mouths, and never expressed what was going on.” Perhaps this relationship wasn’t a surprise back then as it seems with regards Argentina that the Nazi administration had nurtured this link between the countries with the promise of important trade concessions after the war had it gone the other way. Though the issue is not a secret one anymore in Argentina Puenzo was surprised that more artists haven’t explored the issue, she admits that early on this aspect of the story was “More invention than investigation” but that changed when she contacted the historian Carlos Echeverria. One of the locations for the film is the City of Bariloche where Erich Preibke, who was eventually convicted of committing war crimes, was Director of the German School in the 60s when Echeverria attended it, in fact it was a documentary made by Echeverria called Pact of Silence that led to Preibke’s extradition so it wasn’t a great surprise that the film found a lot of resistance to shooting there. Agreements were cancelled as the crew arrived on set and the hotel which is featured and is also where the cast and crew stayed made life difficult early on as negotiations were made to book the venue in what was the off-season for the business. Puenzo has taken these issues of complicity, deceit and denial and transposed them to a family and a coming of age tale and as like in her other films explores the desire to conform and the sacrifices therein within that unit and that society. Exactly what results from those decisions we shall see…….. The 4’s and 5’s poured in after Wakolda, the audience on the whole ‘really enjoyed the film’ finding it ‘atmospheric’, ‘disturbing’ with ‘plenty of suspense’ and ‘totally absorbing’. One member was fascinated by the historical aspects that are ‘too little known’ whilst another ‘felt very much as though it was in the 60s’, the sense of place was enhanced by the cinematography, it was thought ‘fantastic’ by many whilst one reviewer who ‘came for the scenery’ was ‘not disappointed’ as the film ‘held (their) attention throughout. The film was especially interesting to one viewer as they and their family had visited the hotel featured in 2006! One writer found the film ‘Horrendously slow’ though they enjoyed the soundtrack and another felt the film ‘lacked a final scene’ but the majority greatly appreciated the film, ‘a perfect example of how the big screen is simply the best way to see an excellent film.’ recorded a member. The ‘chilling story’ and ‘chilling man’ left an impression on all, as this ‘thought provoking film’ told its ‘seductive, yet sinister’ story. 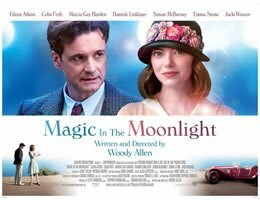 Tonight’s film, “Magic In The Moonlight”, was released in the US in July of this year, and in the UK in September. It is set in the late 1920s, chiefly in the South of France, and was also filmed in that location. The cinematography, by Darius Khondji, has received many plaudits, and some critics have seen similarities with “The Great Gatsby” in terms of the atmosphere created. Such impressions are enhanced by the soundtrack, which includes upwards of 15 pieces of music from the period. Tonight’s movie was of course written and directed by Woody Allen, and the size of tonight’s audience bears witness to the continuing fascination with the man and his work. It would take a whole evening’s lecture to do justice to his career, so for brevity here some key statistics will have to suffice to illustrate his extraordinary life. Allen is now aged 79, and his career in the movies spans more than 50 years. He has directed and/or written and/or acted in 74 films to date. The first of these was “What’s New Pussycat?” in 1965 in which he acted and for which he wrote the screenplay. Across his career as a whole, the general consensus of the critics appears to be that the quality of his acting exceeds that of his writing. Aside from the movies he has worked in the theatre and played clarinet in a jazz ensemble. He has been married three times and had two other long term partners. Finally he has undergone psychoanalysis for 37 years. He is a remarkable man whichever way you look at it. The leading man in tonight’s film is Colin Firth, now in his mid 50s. He is familiar to us on both the big and small screen, including appearances in over fifty movies. His most acclaimed role was as King George VI in “The King’s Speech”, for which he won an Oscar. Other notable appearances have been in “The English Patient”, “Shakespeare In Love”, and the TV adaptation of “Pride and Prejudice”. As many of tonight’s audience will be aware, Firth is a man with many local connections: he was born in Hampshire, in Grayshott, went to what is now King’s School in Winchester, and then on to Barton Peveril college. Firth’s co-star is Emma Stone, who comes from a completely different background, having been born in Scottsdale near Phoenix in Arizona. She is only 26, and although her acting in “Magic In The Moonlight” has received praise, the age difference between her and Firth has given rise to some debate. It has been suggested that it is piece of miscasting and reduces the plausibility of the story. Stone’s best received role prior to tonight’s film was in the 2010 teen comedy “Easy A”. This was her debut as lead actress, for which she was nominated for a Golden Globe award. Spider Man addicts will recognise her from the 2012 production “Amazing Spider Man” and this year’s unoriginally named follow up “Amazing Spider Man 2”, in which she plays the hero’s first true love Gwen Stacy. Finally, cosmetic buyers will recognise as a major face in the Revlon ads. To sum up, tonight’s movie is, on the surface at least, a light romantic comedy involving the world of magicians, in which the humour comes from the idiosyncrasies of the script rather than a host of jokes. Critics have used a lot of somewhat anodyne words such as “pleasant”, “delightful” and “enchanting”. Perhaps because of Allen’s long-declared atheism, however, some critics have seen something deeper: the conflict between rationalism on one hand and mysticism and religion on the other. Now let’s see the movie and make our own minds up! Not all of Monday’s reviewers were swept up by the magic. ‘Alright, a little long’, ‘Ok, bit boring at times’, ‘felt disjointed.. ..bit too obvious’ wrote some of the detractors. ‘Thought it was very “wooden” acting’ wrote one member, continuing ‘Felt like I was at a Repertory Theatre at the beginning – rather disappointing’. ‘Pleasant but weak’, recorded another saying it was to be ‘Damned with faint praise.’ In most cases though there was usually a compliment somewhere in the comment even the severest critic; ‘Very poor – not plausible as a story’, found time to praise the ‘Lovely sets and costumes’. The 2/3rd’s majority in contrast very much liked the film, ‘Brilliant film, great subplot’, ‘Amusing, well made’, ‘Excellent, cheerful and entertaining’ encompassed many of the positives though none quite matched ‘I f***** loved it’. Many recognised that it was ‘Lighthearted’, ‘Gentle’, ‘Nothing of consequence’ and ‘A good festive season choice’ whilst some found ‘Beautiful, deep’ themes within wishing a ‘Long life to W. Allen! !’ at the same time. For one it was ‘Reminiscent of Great Gatsby’ as another thought ‘Mr. Allen (was) back on form’. As the compliments for the music, cast and scenery poured in one writer even decided to praise themselves and their fellow members, ‘Didn’t we choose well’. Mr. Turner is Mike Leigh’s latest film. 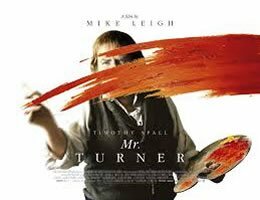 It has a running time of 2hrs 30minutes and in the title role as Turner is Timothy Spall, one of Mike Leigh’s longtime collaborators. The film covers the last 20 plus years of Turner’s life, from 1828 to his death in 1851. By this time – and Turner had begun his painting career in 1796 – he was at the height of his popularity. From this point at the end of the 1820s, as he continued his career, Turner’s painting style evolved from a naturalistic, “show it as it looks” style to an increasingly “show it as it feels” way of approaching subjects. In his own time, this radical approach was largely rejected and often derided by the artistic and cultural establishment. To get to grips with the character of Turner, Timothy Spall did the equivalent of an artistic Boot Camp. He learned how to paint so what is seen on the screen is him actually doing the job. This authenticity of experience, in so far as it was possible to replicate it, was an essential part of Mike Leigh’s intent to create a believable experience of early Victorian Britain where the sailing ship and horse-drawn technology of the 18th Century was mutating by degrees into the steam-driven and mechanised 19th Century. In Mr. Turner, Mike Leigh sees Turner as a man of his times, an ordinary person in that he carried the the imperfections of humanity we all do. And yet, one so creatively attuned to the changes in the world he lived in that he could, and did, document those changes in paint. There were a number of comments about the length of the film, ‘A little slow paced’, and ‘Rather slow’, ranged to ‘Could have been half an hour shorter!’ to ‘Too long and boring’ with ‘Too many gaps in the story’ whilst one viewer found it purposefully ‘Slow moving and deliberate – Loved it!’. Some viewers picked up on the darker elements finding it ‘Beautiful if unsettling’, ‘Strange’ and ‘Very depressing’ which to their mind led to its lack of recent nominations. Turner was thought ‘A great man of simple needs and humble disposition’ as another writer learnt ‘How to push the boundaries’ by his example. The majority of the forms contained 4’s and 5/5’s as the ‘Great character acting’ of the cast was praised by many with the ‘Thoroughly entertaining’ Timothy Spall awarded an ‘Oscar for best grunting!’ by one writer. Tonight’s film, “The Homesman”, premiered at Cannes last year, and was released in the US in November. It was directed, co-written by, and stars Tommy Lee Jones. It is based on the 1988 novel by Glendon Swarthout, and like the book is set in the US in the 1850s. Swarthout’s books have been the basis of a number of films, the best known being “The Shootist”, John Wayne’s final movie. Jones is now 68, and he has appeared in more than fifty movies since he made his acting debut with a small role in “Love Story” back in 1970. In the 1990s he won two Oscars for his roles in “JFK” and “The Fugitive”. We have seen him here at the Film Club when we presented “No Country For Old Men”. Despite his long career in the movies, however, this is only his third film as director. “The Homesman” has been generally referred to as a Western, but in two respects at least it is not typical of its genre. Firstly it is not placed in conventional western settings such as Texas, Arizona or California. Instead it is set in what is now termed the mid-West, in Nebraska and Iowa. However in the 1850s these were frontier territories- Nebraska did not become a state until 1867. Secondly, despite its title, it is very much focused on the lives of women, and the challenges they faced in the brutal and bleak environment of this frontier. 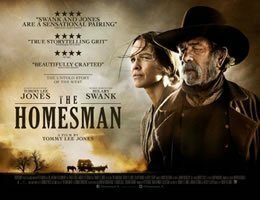 By the way, in case you are wondering, “Homesman” was the term used for someone tasked with taking immigrant settlers back home. In keeping with its subject matter, the movie has a strong female cast. Alongside Jones as co-star is Hilary Swank. By coincidence or otherwise, Swank, 40, was born in Nebraska and many of her family hail from Iowa. Her movie career kicked off in “Buffy The Vampire Slayer”, since when she’s won two Oscars for Best Actress. She is probably best remembered by us for her portrayal of the female boxer in “Million Dollar Baby” in 2004. Amongst other strong performances, you’ll spot Meryl Streep in a cameo role towards the films conclusion. The innovative music is by a composer called Marco Beltrami, better known for his horror movie soundtracks. In “The Homesman”, in order to give a powerful backdrop to the bleak environment, he has used a number of unusual instruments to depict the wind and so on. Let’s now see the movie and make our own minds up about the music and indeed the movie as a whole! A smaller than average audience rode the range on Monday night and were rewarded with a highly praised film and according to one response ‘the best film (the club) have shown for years’. 4’s and 5’s filled the form as did praise, ‘Powerful’, ‘Great, gritty’, ‘Beautiful!’, ‘Moving’ and ‘Bleak but excellent’ were oft used terms. ‘The story was uncompromising, harrowing and extraordinary’ thought one and ‘Not your usual western!’ wrote another. It was noted that the film described elsewhere as a ‘Feminist Western’ could have been billed in conjunction with International Women’s Day the day before and ‘more could have been mentioned’ and this element was ‘shrugged off’. There was an opinion that the film was ‘Long and dull’ while another thought it ‘A bit of a potboiler that fell off the edge at the end’ but they contrasted with the majority who enjoyed the ‘Delightful photography and music’ inamongst many other elements with one writer enjoying a film which for them ‘Brought humanity out of dire suffering’. This ‘Tough’ representation of frontier life provided ‘A different look at the west’ with the actors ‘Amazing at demonstrating raw emotions’ with Tommy Lee Jones thought ‘Very good’ and Hilary Swank ‘Spectacular’. Tonight’s film is the second film of that name to make it to the OSCAR’s short list. It was also nominated for a Golden Globe, but unfortunately did not win either award, although the first in Kon Tiki released in 1951 won both an OSCAR and a BAFTA as the Best Documentary. 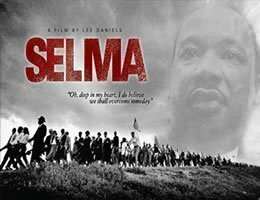 That’s my way of telling you that although tonight’s film is classified as a drama, the story it tells is very much based on factual events. Between the mid 1800’s through to the 1940’s archaeologists and anthropologists were postulating that humans societies in Polynesia had originated in the America’s. At the time, however, there was considerable controversy as to how, with the limited knowledge of navigation thought to be available to them, and only primitive canoes or rafts, they had made the necessary sea crossing. In 1947, a Norwegian explorer Thor Heyerdahl and five fellow adventurers sailed from Peru to the Tuamotus, in French Polynesia, in a pae-pae raft they constructed from balsa wood and other native materials, and christened Kon-Tiki, named after the old name for the Inca Sun God. In modern terms this trip was probably the first practical example of what is now known as experimental archaeology, where by taking limited information on how things were done by our forebears, modern scientists can by trial and error get closer to understanding how certain results were achieved. In 1947 Thor Heyerdahl & his colleagues with a great deal of enthusiasm, limited funding, and at great personal risk put their trust in their belief that such a journey was possible, by attempting to replicate it using what to modern man was a totally untried technology. They were setting off to try and cross nearly 5000 miles of the largest ocean on the planet. Their boat was tied together by hand using reeds, balsa wood and handmade rope. They had none of the modern aids to navigation such as GPS and radio–phones, that are available to 21st century sailors. Although the Kon-Tiki expedition proved that the journey was possible, subsequent investigations and evidence have led the majority of archaeologists and anthropologists to the view that the Polynesian migration started from elsewhere than South America. Wherever they came from some of those early journeys would have been across vast tracts of open ocean What prompted those putative early Polynesians to risk everything for such a journey ? To form a new settlement they must have taken everything they needed with them. Whole families including children, livestock, food as well as seeds to create crops in their new homeland must all have been loaded on their craft. Did their forbears do the double journey so that they knew where they were going ? This dramatised version of the voyage has won international critical acclaim and although I am sure they all deserve a mention, I am not going to try and get my tongue round all the Norwegian names of those involved. You’ll just have to watch the credits. 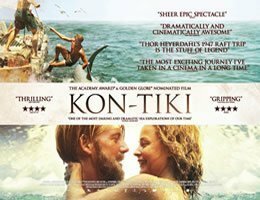 AFC set sail last Monday on the Kon-Tiki to see what was a ‘Very enjoyable’, ‘Exhilarating’, ‘Scary’, and a ‘Thumping good’, film. It was a story that displayed ‘Extraordinary courage’, filled with ‘Brave spirits who push the boundaries’. Comment forms overflowed with positive responses, ‘A compelling watch’, ‘Beautifully and valiantly produced’, and ‘Fantastic photography which emphasised the smallness of man’, were just some of many. One reviewer found it ‘A little slow occasionally a bit corny’, and someone else though ‘It would be better as a documentary’, another positive reviewer remarked they ‘Would like to have seen some of the original documentary’, though the vast majority though it, ‘Very good’. Some had admiration for Heyerdahl, ‘A charismatic leader, who led them right from the beginning’, whilst another recognised, ‘With perserverance he achieved his goal’. In the audience there was someone who remembered, ‘Seeing the original film made in the 1950s’, and another who didn’t know the story but afterwards were, ‘Glad I do now’. One member of the audience, a Norwegian, distantly related to one of the crew and from the same town as the lead actor wrote, ‘Flott film. Beste på mange år. TAKK’. Couldn’t agree more. There were a couple of viewers who thought it ‘Overlong’, and ‘Slow to begin with’, but all felt it still worthwhile including one who ‘Didn’t feel (a) strong depth of emotion’, but still complimented an ‘Excellent performance from (David) Oyelowo’, as did many, ‘Brilliant acting’, and ‘Outstanding’, encompassed many of the opinions. The ‘Amazing British actors’, were ‘Utterly immersed in their characters’, thought one. ‘Powerful’, ‘Excellent’, and ‘Scary’, were the most used words in amongst almost unanimous praise given to Still Alice on Monday night. ‘Extremely moving’, ”Gripping’, and ‘Brilliantly acted’, were some of the others. One reviewer thought it a ‘Tour de force’, as many appreciated the honesty and realistic portrayal of the disease. ‘Harrowing but sharp and straight as an arrow’, said one comment form, ‘An emotional rollercoaster, said another. It ‘Hit very close to home’, for one person.’Crying’, wrote another. It was, ‘Surprisingly close to the book’, thought one viewer, ‘Although Alice in the film came across as ‘softer’ character than in the book,’ added another and it ‘Was more real and less sentimental’ than its source felt a writer. There was one viewer for whom it was ‘Not as emotional as I expected’, as another thought it was, ‘Not as good as Iris’, but both still gave it good marks. There were many compliments for Julianne Moore’s, ‘Sympathetic performance’, which, ‘Caught the essence of Alice with great plausibility’, there was praise too for the ‘Remarkable’, character of Lydia. There was one member who ‘Could have watched it all night’, and the film’s ‘Sensitive portrayal’, gave an ‘Amazing insight’ into the condition. ‘Please find a cure! !’ pleaded one member. This film dates from 1968 and was the child and long-term project of director Stanley Kubrick. He’s a story-teller. He starts at the beginning and goes through to the end. That’s what he does. His previous work had included the intense First World War psychological study Paths of Glory in 1956 and in 1964 the very serious comedy, Dr Strangelove. 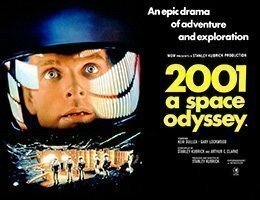 2001 itself is about our place in the universe and the premise that we are not alone and are not – and never have been – the biggest kid on the block. It’s not about alien invasion but about our capacity, our need, to search out the truth and to engage with that truth. “be a logical extension of today’s rapidly developing techniques and technologies”. In other words, it was going to be scientifically plausible and therefore believable. This he achieves as you will see. With 2001, Kubrick set the benchmark for the necessary Look and Feel that all future Science Fiction films had to reference if they wanted their audiences to believe in the story they were telling. Think Alien in 1979, Armageddon almost 20 years later and more recently, both Gravity and Interstellar. That’s a pretty good legacy to have. Well, that’s enough from me. Thank you for your kind attention. Let’s all enjoy the film. There was much high praise, an ‘EPIC!’ filled the whole of one comment form adding it was, ‘an enduring and timeless piece of cinema.’ ‘Fantastic score’, ‘Visually stunning’, and ‘Ahead of its time’, were some of many examples. There were some detractors, ‘Too long’, ‘Self indulgent’, ‘Artistic and overblown’, ‘Weird’, ‘Pretentious, autistic – I could go on’, and all offered middling to low scores.